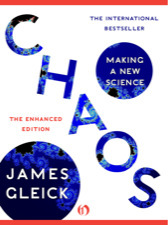 A few weeks ago I mentioned the enhanced edition of Chaos: The Making of a New Science by James Gleick. That sums it up very well. I’ve no desire to get all stern-faced and pompous here, but that book changed my understanding of how the world works. It still amazes me how many supposed experts – I’m looking at you, economic pundits of the past few years – still don’t understand what this book has to say. I think it’s a terrible thing that chaos is not taught as part of high school maths. Chaos, in other words, gets the thumbs up from me. It’s a great book. Pretty nice, huh? But how much video is there in the rest of the book, and how does it ‘enhance’ the text? Well, there are just six more videos throughout the remaining 380 pages (paperback equivalent), each on average less than a minute long. As you’ve paid a fiver extra to get this video (£11.99 versus the £6.99 ‘non-enhanced’ version in the iBookstore), that’s pretty rubbish. Each of these videos explains a different concept with motion graphics and a voiceover. The script of the voiceover is largely taken from the main text, so it’s either what you’ve just read or what you’re just about to read. The effect of this is to highlight how these 6 videos have just been slapped on top of an existing product, rather than integrated more fully into it. This is a real shame because this book should really benefit from the relevant speeds of video and text in communicating information. In some (possibly most) circumstances video is the slower medium, hence we expect film adaptations to cut out large chunks of the novels they are based on. In this subject, though, video can get concepts such as the Mandlebrot set across far quicker than prose. But this benefit is lost, though, when video is just sprinkled on top of the text, and the text is still expected to do the heavy lifting. The text never discusses the videos that the reader has just been shown, or even acknowledges that they exist. Indeed, in the original paper version there were some colour plates in the middle which contained a series of stills of images taken from a movie of the Mandlebrot set. Bizarrely, those stills are still included here, and they are still in the middle of the book. No effort has been made to move them to a more suitable part of the text or make them relevant to the new format. It’s as clear an indication as any as to how cosmetic the ‘enhancements’ are. What we learn from this enhanced edition is that, if we’re to add video to non-fiction, then the text needs to be written around the video as much as the video needs to support the text. This will no doubt give publishers a hot flush, for we’re talking about a different version of the text to the non-enhanced version. But there is an existing model that might be useful to think about here. Consider the tie-in book for a large budget television series. I’m talking about the type of documentary series where Prof. Brian Cox enigmatically stands alone among 1080p mountains whilst the Cosmos explodes above him – you know the sort of thing. Both the series and the book contain the same information (more or less). But the book does not contain the documentary script, nor does Prof Cox stand on his mountain and read out the book. The research that went into that series has been written up twice, and shaped for each of the different media. Enhanced non-fiction book apps that contain video (and ideally, interactive elements to play with, something that would have been very welcome here) are going to be prestige, big budget productions. They are most likely going to be linked to big names and television exposure. We can imagine how the research and filming of these big BBC or Discovery series could be used to create three separate versions – the TV series, the tie-in book, and the book app. Each would get the same information across according to the strengths of their own media. In this scenario, enhanced books are going to be very rewarding. It is possible to imagine how the enhanced book app would be the premier version, combining the strengths of both the TV series and the book with interactivity. That, I think, is going to be where these are heading. As for Gleick’s Chaos, it’s still as brilliant as it ever was. But the enhanced version is no more brilliant than the non-enhanced version and, unless the price difference is removed, I have to say that the normal version is the better buy. As you can see, it’s very nicely done. I’ll talk about it properly once I’ve finished reading it, but for now I’ll just say that its a great book and one that lends itself well to added video content. But if the product is sound, how commercially successful has it been? Chaos: The Enhanced Edition is only available through Apple’s iBookstore (as opposed to the App Store, where most books mentioned on this blog come from). It was released back in March, and I can remember a lot of coverage on blogs like Boing Boing at the time, so it was promoted reasonably well. I do not have access to any sales figures, but looking at the iBooks it still hasn’t been rated by anyone, let alone reviewed, which doesn’t imply the sort of success that it deserves. The non-enhanced version – the regular ebook – does have a review, and there are many, many reviews of the (non-enhanced) Kindle version over at Amazon. Gaining any non-agenda data about iBookstore sales is a bit of challenge. There is the suspicion, though, that a sizeable proportion of those who read on iPads read Kindle books rather than buy iBooks. The reading experience of iBooks is good, but ultimately the smaller range and higher prices of the iBookstore has sent people to Kindle – along with, I suspect, a sense that Kindle books are more future proof and will remain accessible from more devices. Apple are ultimately more of a “you must do it our way” company than Amazon. It may well be that there is – and there will remain – noticeable less ‘footfall’ in the iBookstore than the App store. That said, there is a noticeable pricing issue here. The enhanced version, with the video, is £11.99. Next to it in the iBookstore is the non-enhanced version at £6.99. Meanwhile, Amazon will sell it to you in Kindle format for £6.50 and in paperback for £6.84. The video enhancements, then, nearly double the cost. So The Enhanced Edition has been priced – relative to the non-enhanced version – as a premium product. Looking at the high prices of audiobooks implies that there is an audience of book-lovers who will pay premium prices – the audiobook for the last Harry Potter, for example, cost 75 quid. But tablet books are not a nicely-packaged physical product. They are digital. And all implications are that there is a psychological issue about paying premium prices for digital content. It may well be that the price of Chaos: The Enhanced Edition is a real problem. The thing is though, £12.99 isn’t that much for a book. Most readers will have spent that for a physical book, and thought nothing of it. For a good book that gives 40+ hours of pleasure, it’s a bargain. But if £12.99 does prove too much for a tablet book, or if iBooks-only availabilty does prove to be limiting, then the budget for producing them is going to be a real issue.